I am not sure why I don’t make honey glazed ham more often. I only make it around the holidays and I swear, it is so good that I could almost eat the whole ham myself! But maybe that is why it tastes so good. Carving a delicious honey glazed ham for our holiday dinner. Who am I kidding, it tastes so good because of the delicious honey glaze that is spread all over the ham! Over the years I have tried several different types of glazes. My first attempt included just 2 basic ingredients: brown sugar and orange juice. I thought it would be best to keep things simple back then and I was afraid to branch outside of the norm too much in fear of failure. Unfortunately I didn’t know that I should wait until the last 30 minutes of the cooking process before adding the glaze. The glaze got a little over done and made the entire top of the ham dark and crusty. Not quite what I was going for. 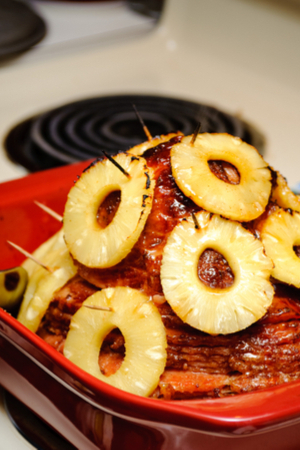 One of the first attempts included pineapple slices on the outside of the ham. So the next time I stuck with the same concept, but added in a little pineapple juice as well. In fact, I even put pineapple slices on top of the ham. And of course, I waited until the last 30 minutes to baste on the glaze. I was afraid the glaze would just melt off the top so every 10 minutes I would put a baster in the bottom of the roasting pan and give the ham glaze shower. The pineapple slices were a little overcooked and began to fall off by the time the ham was done. And the flavor was okay, but a little too sweet in my opinion. Adding Dijon mustard to the glaze was the perfect ingredient to balance out the sweetness. So I knew that I needed to add something to balance out the sweetness. What else goes good with ham? Dijon Mustard, of course! That was the perfect addition to my glaze. A tangy condiment added just enough balance of the strong citrus flavor of the orange juice and the tropical flavor of the pineapple juice. 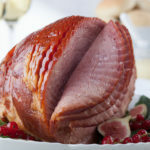 We also use Dijon mustard in our Holiday Ham recipe. Add in a little ground cloves and you have the BEST honey glazed ham! What Type Of Ham Should You Use? The big question is what type of ham should I buy? Our glaze being poured over a bone-in spiral ham. Hands down, without a doubt, buy a bone-in ham. The bone adds so much flavor to the ham during the cooking process. I prefer to buy a pre-cut spiral ham whenever possible. 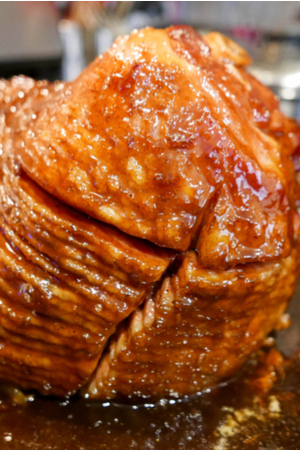 This allows the honey glaze to drip into the center of the ham, providing additional flavor in every bite. Should I Use A Baster or Brush? I have made honey glazed ham with both a baster and a brush. The choice is based on what type of ham that you have purchased. However, if you use a whole ham that has not been pre-sliced, I would recommend using a brush. The force of the bristles gets glaze in all those tiny nooks and crannies of the outer portion of the ham. 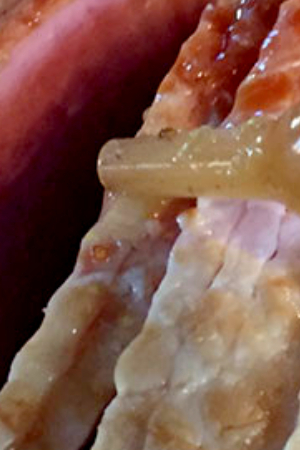 A close up picture of the baster pouring the glaze between the ham layers. If you bought a spiral ham, stick with a baster. It would nearly be impossible to brush each individual slice and a baster is quick and easy. So this year, if you are looking for a way to make the most delicious honey glazed ham, you are off to a fantastic start! 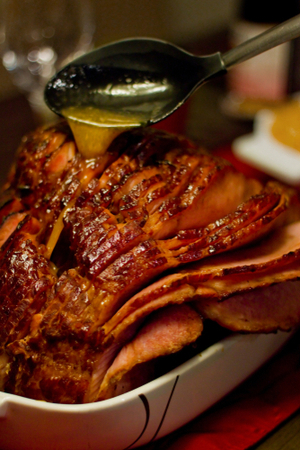 How to cook the perfect ham with a sweet honey glaze that will leave you begging for more! Place ham in a roasting pan. Bake uncovered for 1 1/2 hours. Remove ham from oven and brush the glaze all over the ham. Bake for an additional 30 to 45 minutes, brushing the ham with the glaze every 10 minutes. 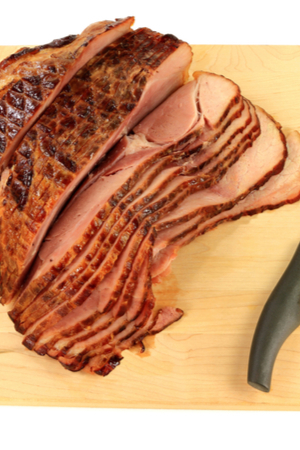 If the ham is getting too brown on the top, place a cover or aluminum foil over the top. Once cooked, remove from oven and tent with foil until ready to be served. ← Pumpkin Cheeseball Recipe – Only 5 Ingredients!